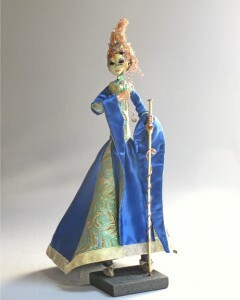 I had started working on a second doll with an enameled mask even before the recent sale of her predecessor “Carnivale”. Taking my hand hammered copper faces to a new place with the addition of torch fired enamel provides a multitude of new design and color options. 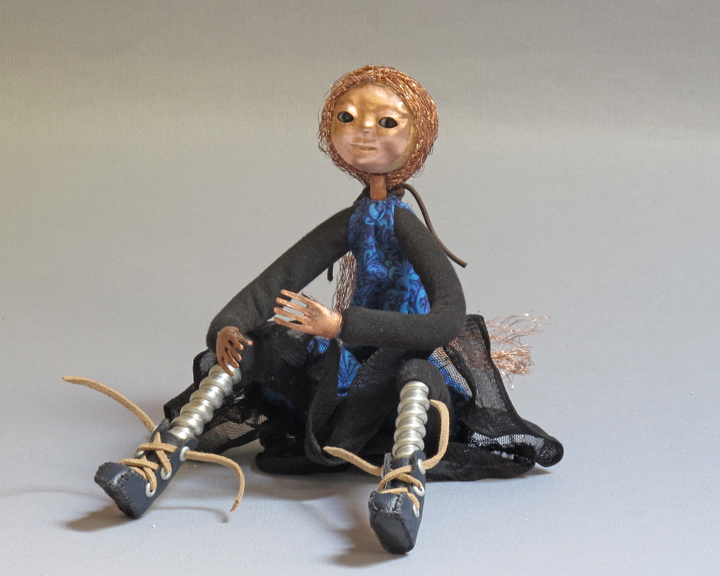 This doll, Mirror Mask, has an additional bit of intrigue for the viewer. Where Carnivale was wearing her mask and only allowed a glimpse of her enameled eyes, Mirror Mask has pulled her mask slightly away from her face. What the viewer glimpses behind is their own image in a mirror. With her hair piled high and bejeweled, and her peacock hued gown and walking stick, she’s obviously off to a very interesting ball. The other piece I’ve been working on this week goes in a different direction. While still technically an art doll, she will be one that can reside inside or out. I have several shows coming up in the next few months, and at least one takes place in a garden setting. 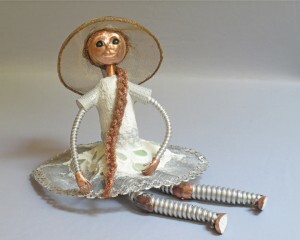 I’ve decided to create some “garden dolls” for that show. the torso of the first is cast concrete utilizing a recycled plastic bottle for my form. She is still curing in my outside workspace, so ill wait to share an image of her in my next post. 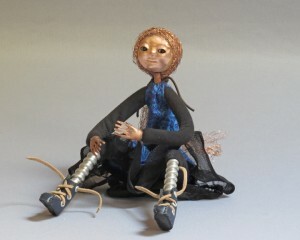 This entry was posted in Art Dolls and tagged art, art doll, copper, enamel, figure, figure sculpture, mixed media, one of a kind, sculpture on May 16, 2014 by lynnadmin.